Former Dionysus recording artists the Buttersprites carry on the Pan-Asian volcanic punk/pop torch with their new band MiniRex. Catch them on an all-Seattle bill December 5th at Mars Bars (609 Eastlake Ave E, Seattle, Washington, 98109) with local dub disco act Library Science and power pop band The Suspicions. 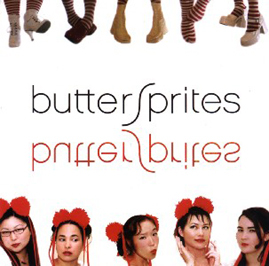 The Buttersprites song “Cherry Blossom” was recently heard on the “Believe” episode of television show Flash Forward and can be found on their Dionysus full-length. Watch the episode now on the ABC website or Hulu.com! Upcoming Ruby Dee & The Snakehandlers dates! New release from SSSU and Creepy Creeps out now! We’ve just stocked our shelves with the latest Dionysus releases from The Creepy Creeps (“Fink About It!“) and Stereophonic Space Sound Unlimited (“The Spooky Sound Sessions.”) Both are available on vinyl, CD, and as downloads, and the vinyl version of the Creepy Creeps comes on gruesome green wax!